The Eastern Screech-Owl is native to North America and nests throughout the United States and in portions of Canada and Mexico. It is a small owl, 8 inches in length from the top of their ear tufts to the tip of the tail, with a wing span of 22 inches. 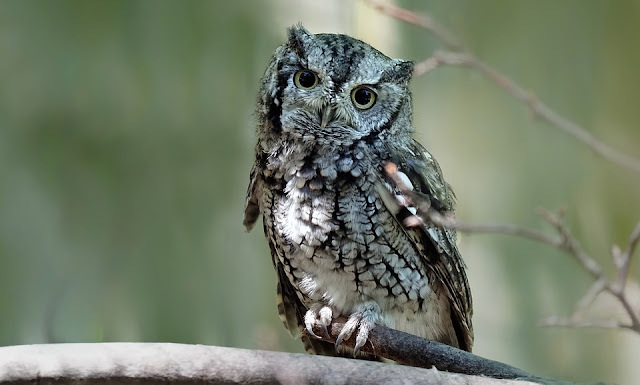 The whinny call of Eastern Screech-Owls are their most frequent vocalizations, particularly during late summer and early fall when young are dispersing and seeking their own territories, but their vocal repertoire also includes various barks, hoots, squeals, and “screeches”. 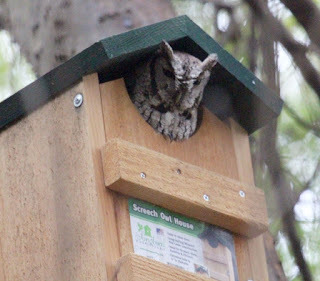 From October–March in Michigan, Eastern Screech-Owls roost in nest boxes and cavities but you may catch them in the entrance occasionally sunbathing in warm winter weather with fluffed breast and facial plumage. 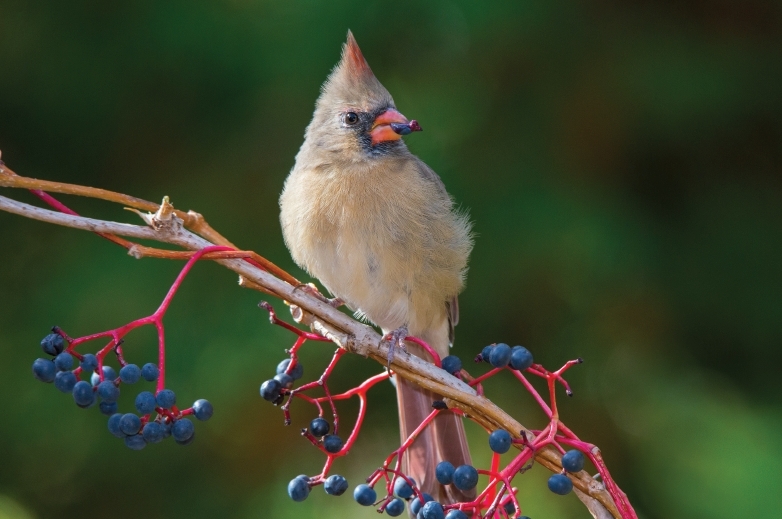 You can get some kind of "wild bird seed" almost anywhere: the hardware store, the pet store, the grocery store. Sometimes they may seem like a bargain, but all too often they are a bad choice for you and your birds. Beware seed mixes that look like the top picture to the right, dominated by red round seeds with a few scattered sunflowers. If the ingredient list shows milo, sorghum, wheat, canary seed, significant amounts of corn, or mysterious unspecified "grain products," it isn't a good blend for mid-Michigan. Instead, look for a lot of sunflower, which may come in the familiar black shell (as in the middle picture of our Choice Blend) or with the shells removed (as in the bottom picture of our No-Mess Blend). Throwing in "cheap" blends to stretch your "good" seed is just wasteful because you can't trick the birds. They will sweep the seeds they don't like to the ground. 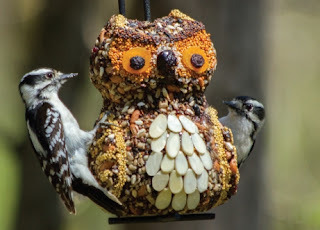 While Sunflower seed is the favorite of most of the backyard seed eating birds like the finches, I also like to have peanuts in the blend to entice all the bug eating birds like the chickadees, nuthatches, woodpeckers, jays, and wrens. No-mess is the only loose seed blend I use personally. It has the sunflower seed, peanut pieces, and a little millet, but all the hulls are removed so there is no debris on the ground to clean up. Millet attracts the ground feeding birds like the juncos, sparrows, buntings, and doves. Pound for pound, our No-Mess Blend offers the best value because you do not pay for the shells. The birds eat everything! 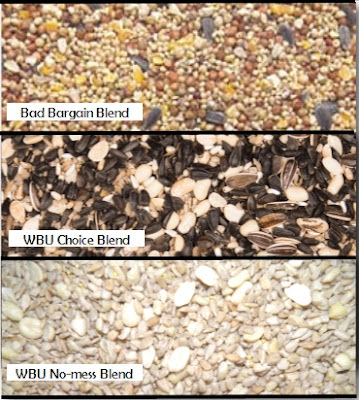 All Wild Birds Unlimited Bird Seed Blends have been formulated regionally to provide the most nutritious food for your birds. Because we learned long ago the better the blend, the better your bird watching! I like Blue Jays and I think they like me too (even if it's only because I feed them). In the fall jays get the urge to gather as much food as they can find and squirrel it away before winter hits. Their favorite food to cache or hide to retrieve and eat at a later time in the wild is acorns, beechnuts and other assorted tree nuts. 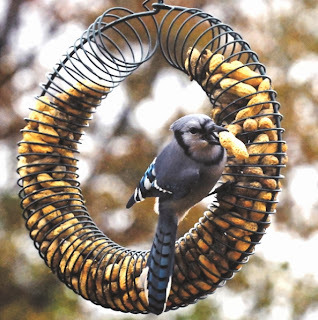 At the feeders jays like to take sunflower seeds, whole corn and peanuts in the shell to cache. 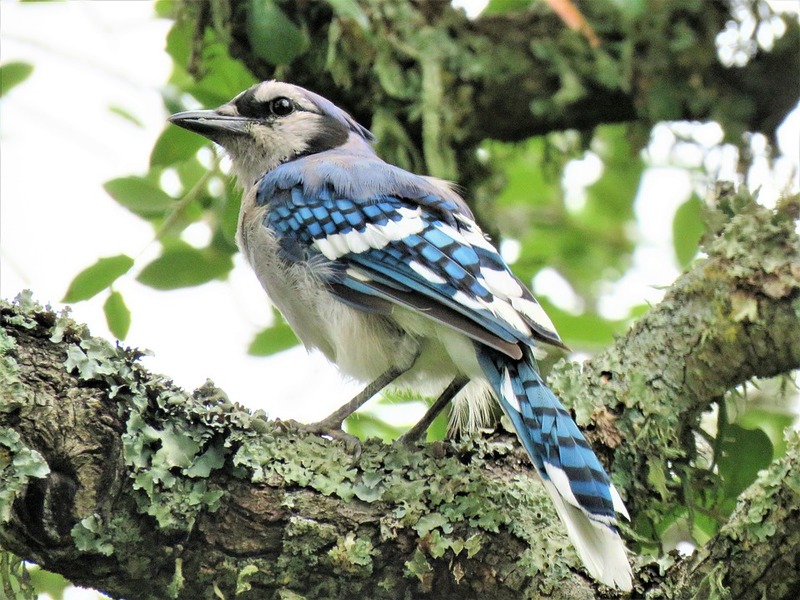 Sometimes perceived as a bully bird, other birds may actually like them because they can cue in to a jay's alert when you fill a feeder or their alarm calls when there is a predator nearby. Blue Jays can make a large variety of sounds. There is also a high-pitched jayer-jayer call that increases in speed that the jays use to call a band together to mob potential predators such as hawks and drive them away from the area. Blue jays also form long-lasting, monogamous pair bonds. These bonds usually last until one of the pair dies. Their name “Jay” has its origins from the Latin “gaius” meaning “gay or merry” and they do make me happy. I’m taking some peanuts home tonight for my feeder! Fox Sparrows that nest across northern Canada and Alaska, migrate at night to the southeastern United States. On their way they south they stop for a couple weeks in Michigan in October to early November. Fox Sparrows spend a lot of time on the ground, using their sturdy legs to kick away leaf litter in search of insects and seeds. They rarely venture far from cover, and they frequently associate with other sparrows. Sunflower seeds, millet, safflower, peanuts and peanut butter suet are some of the most popular foods that attract sparrows to tray or ground bird feeders. Planting shrubs or berry bushes at the edges of your yard, or keeping a brush pile, are good ways to provide places for Fox Sparrows to forage. 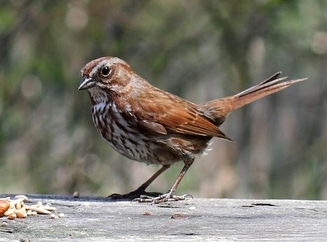 The overall reddish brown appearance of the Fox Sparrow inspired taxonomists to name it after a red fox. Fox Sparrows are generally rust-brown above with a mix of rust and gray on the head, and heavy brownish splotches on the flanks and the center of the chest. The bill can range from yellowish to dark gray. 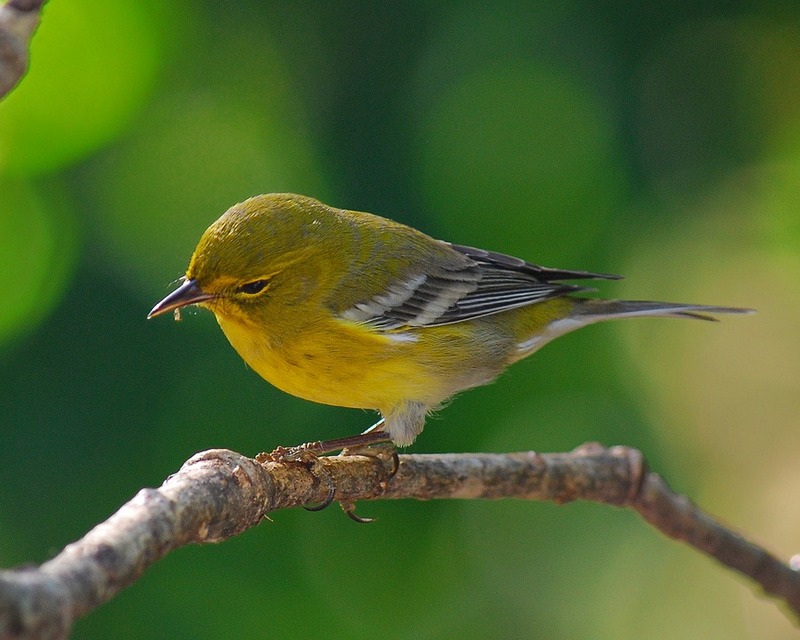 The Blue-headed Vireo's peak migration through mid-Michigan is September to the first couple weeks of October. They winter farther north than the other vireos, with many remaining through the winter in the southeastern states. Sometimes the people naming the birds see colors that I don't. Their head has a gray hood of feathers with blue tinges in the sun, white spectacles, and white throat. 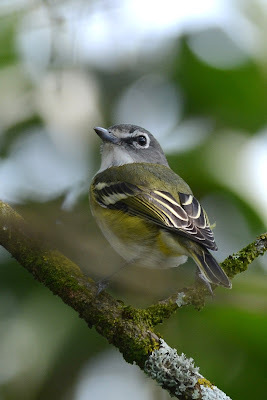 They are a medium-sized vireo with olive-green above, whitish below, and yellow sides. Their wings are dark gray with two white or pale yellow bars. Their diet consists mainly of bugs, berries and small fruits. 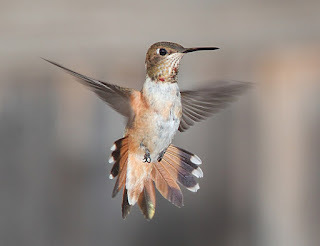 Look for them at the suet feeder and the bird bath as they migrate through in the spring and fall. 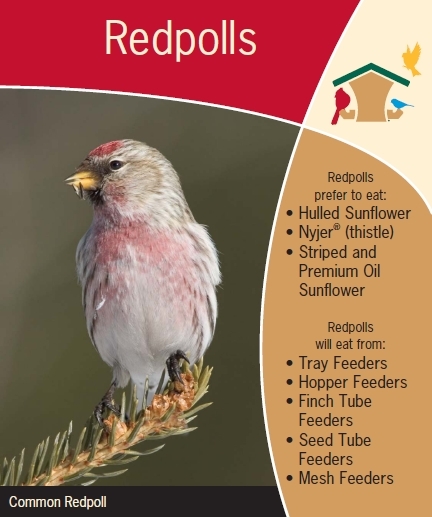 Many birds will have a difficult time finding natural foods this winter. Ron Pittaway, an Ontario Field Ornithologist, collects data on the seasonal seed, berry, and cone crops across Canada to determine if there will be enough natural foods to sustain the hordes of finches and other perching birds in the northern forests or if the birds will need to migrate further south. Most years there is enough food. 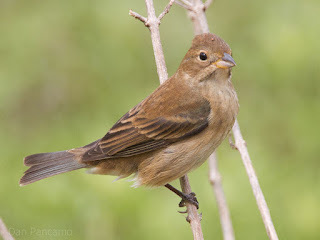 However, when there are widespread crop failures, either due to poor climatic conditions or insect outbreaks, the result is an irruption of birds at our mid-Michigan feeders. The 2018-2019 Winter Finch Forecast predicts it is going to be one of those years we're are going to see a lot of birds! I've already seen and heard an unusually large number of Red-breasted Nuthatches and Purple Finches are also making their way down. In late November to February expect to see siskins, redpolls, and perhaps some Red or White-winged Crossbills, as well as Pine and Evening Grosbeaks. 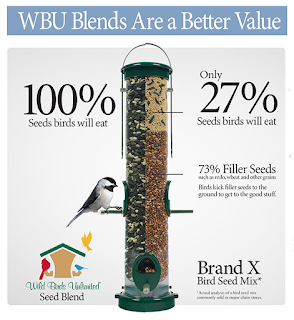 If you have feeders up, keep them full of the Wild Birds Unlimited No-mess blend or any other blend with a high content of sunflower seed as well as a Nyjer thistle feeder. And fruiting trees and bushes along with a source of open water like a heated bird bath will also encourage these out-of-towners to drop in for a visit. Warblers aren't the only new birds passing through in the fall. Flickers may migrate through or even choose to winter in our mid-Michigan yards. 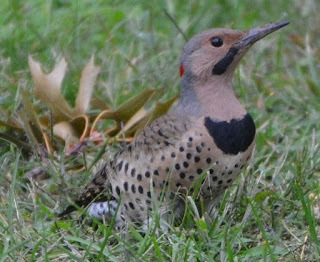 The Northern Flicker (Colaptes auratus) is a medium-sized woodpecker native to most of North America. Unlike most woodpeckers, the flicker spends a lot of time hopping around the ground like a robin looking for bugs, especially ants. Along with bird feeders, it is always good to think about landscaping with native plants for birds to find food naturally. A vigorous and fast growing vine, the Virginia Creeper attracts a variety of fruit eating birds in the fall through the winter. Cardinals, chickadees, nuthatches, mockingbirds, catbirds, finches, flycatchers, tanagers, swallows, vireos, warblers, woodpeckers, thrushes and more will enjoy the fruit and shelter the vine provides. The leaves provide early fall color, turning brilliant mauve, red, and purple, while the small flowers ripen into bluish fruits. This perennial vine grows in a variety of conditions from full sun to shade, and moist, well-drained soils. With the right native plants, arranged to mimic natural ecosystems, you will provide birds with food, water, shelter, and nesting places. Instead of just visiting your garden to snack, birds will call it home. Do Indigo Buntings travel in flocks? We have 4 on the feeder now and more in the lilacs. Flocks of Indigo Buntings fly through mid-Michigan from September to October as they migrate south for the winter. But they might be hard to identify because they are sporting their winter colors. Female Indigo Buntings are slightly smaller than a House sparrow and have an overall brown or grayish color, with faint streaking on a tan breast. They have short, conical beaks and their legs and feet are black or gray. Males molt their bright indigo blue feathers in late summer and grow irregular, patchy blue and brown feathers. 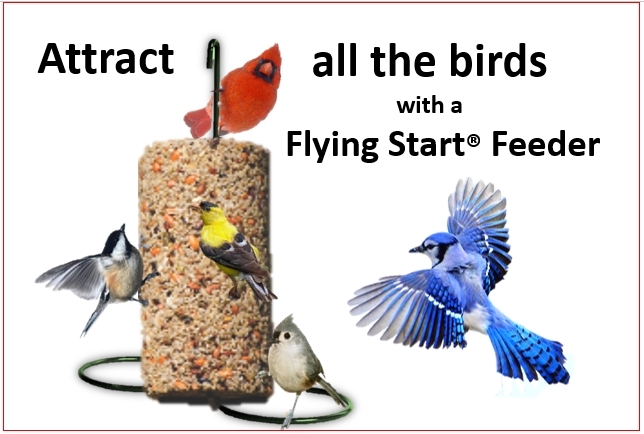 You are a big help if you create bird friendly “stopover site” in your yard with plenty of food, water and shelter. They like the Wild Birds Unlimited No-Mess blend of sunflower chips, peanuts, and millet as well as the Nyjer Thistle in finch feeders. They also forage for wild seeds, nuts, berries, insects, mosquitoes, flies, aphids, small spiders, buds, goldenrod, thistle, grasses, and herbs. Research reveals that Indigo Buntings migrate at night in flocks, using the stars for guidance. The birds possess an internal clock that enables them to continually adjust their angle of orientation to a star—even as that star moves through the night sky. 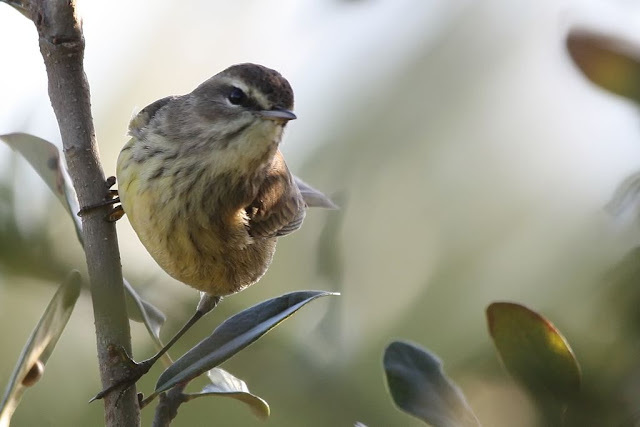 Some buntings stop to winter in Florida and south Texas but most go to shrubby, weedy field areas in Mexico and mix in with other buntings like the Painted, Lazuli, Varied, and Orange-breasted Buntings. The small Red-breasted Nuthatch is one of the friendliest birds that comes down from Canada to spend the winter with us in mid-Michigan. Nuthatches are small, short-tailed birds with pointy black beaks and strong feet. They are fun to watch especially as they forage down tree trucks, often head-first from the top to the bottom, picking insects and grubs from the under the bark. We have the larger White-breasted Nuthatch year-round visiting the sunflower, suet and nut feeders. The red-breasted join them from September to May. They have a blue-gray back, a rusty red breast and a black cap with a white stripe above the eye. They are about 4 ½ inches long and weigh less then ½ an ounce. Male and female red-breasted nuthatches look alike, except the female has a bluish black cap and paler underparts. 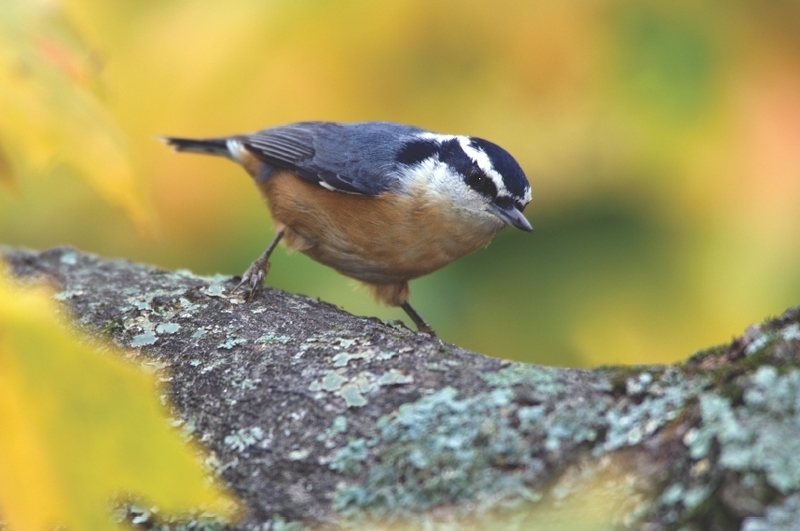 Red-breasted nuthatches are native throughout the nearctic region and are the only species in the nuthatch (Sittidae) family that migrates south in the fall. They make it a treat to fill the feeders on cold mornings when they perch just above your shoulder and cheer you on. 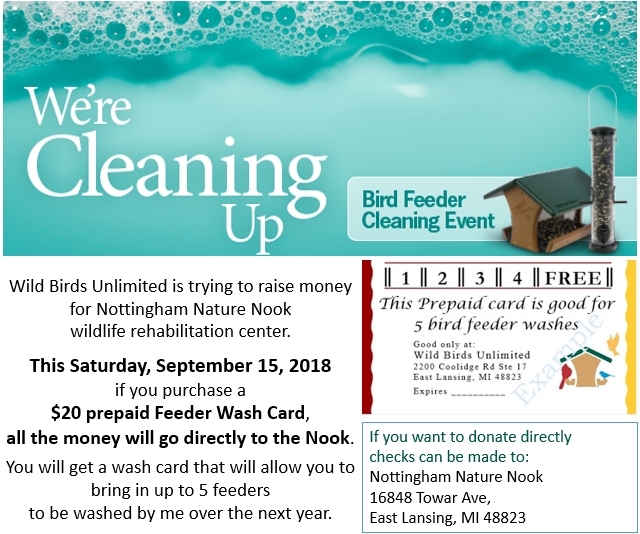 Wild Birds Unlimited's fundraising drive helped raise over $1500 for Nottingham Nature Nook. The proceeds from the sale of Feeder Wash Cards plus extra cash donations resulted in a generous amount of money! 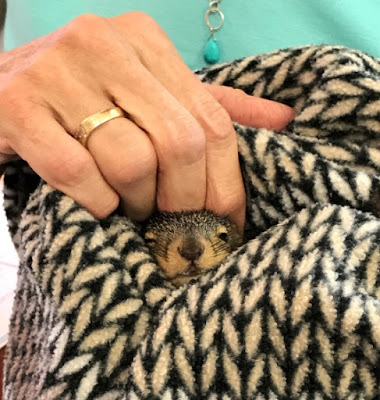 Cheryl Connell-Marsh, the certified wildlife rehabilitation specialist, was kind enough to come to the store Saturday for a couple hours with two adorable baby fox squirrels that she is caring for. 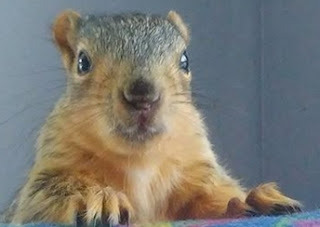 I don’t know how she manages to save so many birds, squirrels, rabbits, foxes and many other critters in need each year. It is a huge job (not only in time but also emotionally and financially) that she takes on voluntarily in addition to running her own business. Some birds passing through in the fall, as they migrate south, may look similar to our common little brown House Sparrows. But keep your eyes open. Many birds migrate at night. If you provide a nice rest stop you may wake up to see some different birds, that were riding the winds all night, stop by to rest and recuperate under the feeders or at the bath. 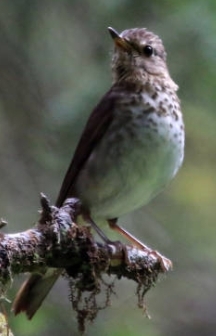 Yesterday I came to the Wild Birds Unlimited store and found a Swainson’s Thrush stuck in the awning. I dragged out my ladder and pool skimming net and thankfully was able to scoop the bird out. My thrush just got a little confused in the awing but was fine after I brought him down. But if you find a bird that needs help, call a licensed wildlife rehabilitator. 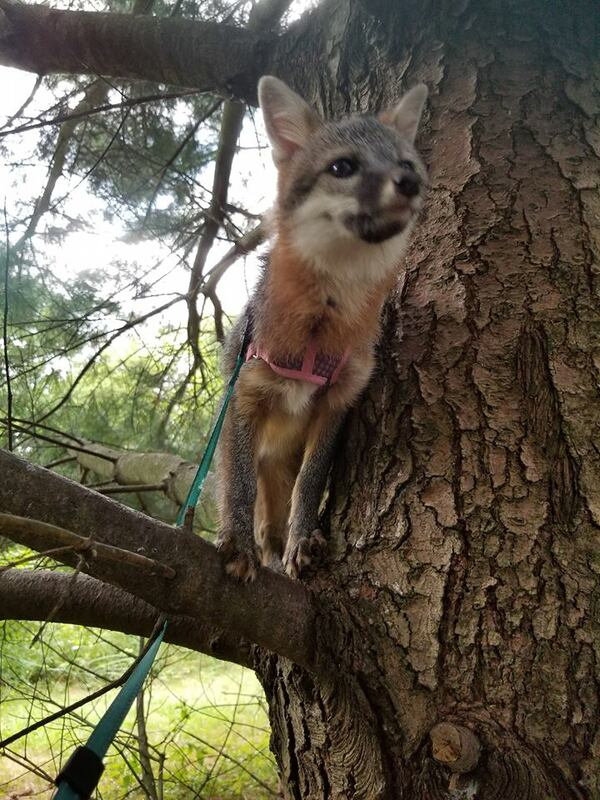 A list of licensed rehabilitators can be found by visiting http://www.michigandnr.com/dlr/ or by calling your local DNR office. Downys have a white belly and back and their black wings have white bars. Only the males have a red patch on the back of the head. And they are called downy because of the soft white feathers on their back. 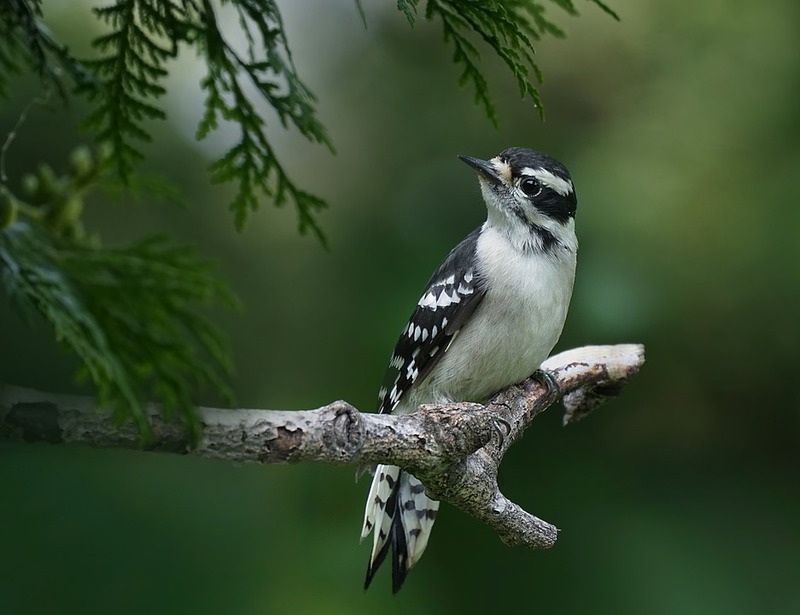 Downy woodpeckers are confused commonly with Hairy woodpeckers, which have similar plumage, but are around 9 inches. However tests revealed that these two birds aren't as closely related as was first thought. A new theory is that the Downys mimicked the markings of the larger Hairys to fool other species into thinking they are the bigger bird. Because if you were a cardinal (twice the size of a downy) and thought you saw a Hairy Woodpecker flying toward you, you might be very quick to get out of the way. Need to keep your mind and hands active? 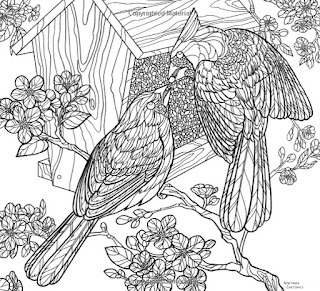 Coloring enthusiasts, bird lovers, and gardeners will all delight in an exciting new coloring book, featuring glorious backyard birds with flowering annuals, perennials, trees, shrubs, and vines. 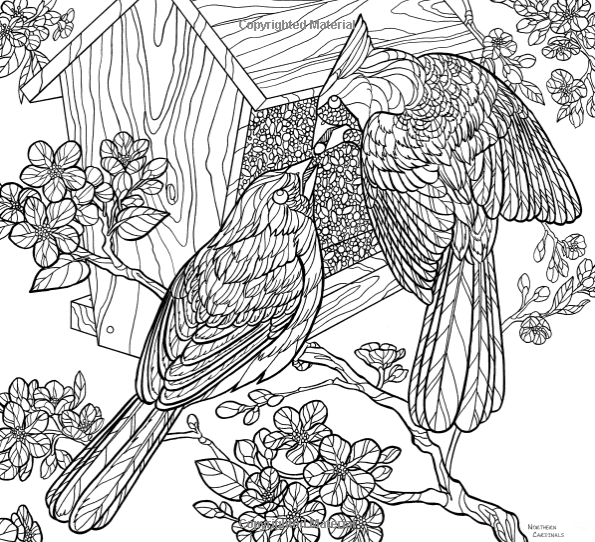 Each coloring page is intricately designed with scientific accuracy to create real and true connections with nature at home. Throughout the pages you will learn more about bird behaviors, plants that can attract new birds, and fun snippets of biology. Backyard Birds and Blossoms was created by the Cornell Lab of Ornithology, the world leader in the study, appreciation, and conservation of birds. As with all Cornell Lab Publishing, 35% of the net proceeds goes directly to projects that support education, and community programs. Wild Birds Unlimited East Lansing, Michigan also has America's Favorite Birds. This gorgeous book features North America's top 35 most popular wild birds. The perforated pages make each finished page easy to save, share, and display.